Bonnie Raitt’s blues credentials are well established. She started her musical career opening for and playing with such blues legends as Son House, Mississippi John Hurt, Mississippi Fred McDowell, and others. Also, over the past 30+ years, she has released one quality album after another, all of which display her warm, soulful vocals and powerful and distinctive slide guitar in blues/rock settings. However, I’ve always thought that to truly appreciate the charms of Ms. Raitt, you really needed to see her live. I’ve found her to be one of the most relaxed, confident performers that I’ve had the pleasure of seeing live and, if possible, her vocals and guitar sound better in person than on wax (or aluminum, or whatever they’re using these days), and she makes her audience feel right at home. 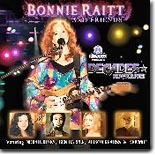 Raitt’s latest release, the DVD/CD set VH1 Classic Presents Decades Rock Live! Bonnie Raitt and Friends (Capitol), does a lot to prove that theory, as Raitt turns in a stellar performance captured by the music channel at Trump Taj Mahal in Atlantic City and augmented by guest appearances from several other noteworthy musicians. Raitt is joined by Allison Krauss, and they team for two tracks, including a gorgeous version of “You,” which features some of Krauss’s wonderful fiddle. Keb’ Mo’ also gets two songs with Raitt, including one of Raitt’s classics, “Love Letter,” and they show a dynamic rapport. Ben Harper’s two tracks (both of which also appear on the CD) are also well done and Harper’s lap steel guitar is always worth a listen, particularly on “Two Lights In The Nighttime.” Norah Jones appears near the end of the concert, and she and Raitt turn in a superlative effort on “I Don’t Want To Change” that is one of the highlights of the performance. To close things out, Raitt brings the whole gang out for “Love Sneakin’ Up On You,” which caps off a very impressive performance. Raitt is in great form and voice and the slide guitar is a thing of beauty when in her hands. While it’s great to have friends to help you, Raitt shows that she’s quite capable of carrying the show herself. The DVD is well-produced, and it also features brief interviews with Raitt and friends. One minor complaint: the DVD features 17 tracks, while the CD, for some reason, only has 11 musical tracks. At only 52 minutes, fine as is, the CD certainly wouldn’t have suffered from the addition of a few more tracks, including Norah Jones’ beautiful version of “Tennessee Waltz” and Raitt’s own “Hear Me Lord” and “Crooked Crown.” However, that shouldn’t keep you from giving this impressive set a spin. There’s plenty of great music to enjoy. 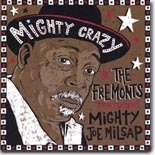 Mighty Crazy, the new release by The Fremonts, Featuring Mighty Joe Milsap, on Wooden Monkey Records, sounds like an Excello recording session that made a pit stop at Chess Records. The Fremonts present the blues like they used to be done, using recording techniques from the mid ’50s, but with just enough modern touches to keep things vibrant. Milsap’s laidback delivery (a cross between Sam Myers and Frank Frost) is ideal for the project and The Fremonts have an excellent grasp of the style, opting for a “less is more” approach that works wonders with the material. The Fremonts boast two guitarists, Patrick Skog and Tony Tomlinson, who alternate stinging leads and tasteful fills and also alternate on bass. Troy Sandow does yeoman’s work on harmonica and drummer Kurt Kalker provides a steady, solid backbeat. Guest musicians include Carl “Sonny” Leyland, who contributes piano to a couple of tracks, and Rip Carson, who sits in on acoustic bass for one track. Produced by Mark Neill (The Paladins, Los Straitjackets, Old 97s, Big Sandy), Mighty Crazy is a fantastic collection of old-school blues that you’ll be listening to over and over. Somewhere in Blues Heaven, Frank Frost, Sam Myers, Slim Harpo, Lightnin’ Slim, and Lonesome Sundown are smiling because their legacy is in very capable hands. For purchasing information, go to the band’s website, www.thefremonts.com. 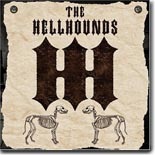 Out of West Palm Beach, Florida, The Hellhounds list a wide variety of influences, ranging from R.L. Burnside, Muddy Waters, Little Walter and Otis Taylor to Jeff Beck and Sonny Landreth. Their music can best be described by the name of their record label, Deltabilly, and features the indomitable vocals and harp of Vince Flora and the hard-driving guitar of Johnny Beemiller. Providing rock-solid support is the rhythm section of bassist Ron Rummage and Memphis drummer Steve Potts (since replaced by Bill Meredith) and their hard work raises the already torrid proceedings up even higher. Their debut release, Halfway Between Somewhere and Nowhere, was produced in Memphis by Jeff Dunn, with Dunn’s father, Memphis R&B icon Donald “Duck” Dunn serving as executive producer. Beemiller and Flora wrote all ten tracks, which are some of the most powerful, relentless rocking blues you’ll ever hear. There’s not much time to catch your breath between tracks. The standout tracks are plentiful. The rip-roaring opener, “Downtown,” kicks things off in rollicking fashion. “On the Run,” recounts Flora’s trip to Sturgis Bike Week. “2 Inch Ball Hitch” is a wry description of Beemiller and Flora’s simultaneous divorces. The harrowing “Rising Tide” describes the 2004 hurricane season in south Florida and would serve as an appropriate theme song for the Gulf Coast during the late summer/early autumn months every year. “Devil Woman” is a blues/rocker in the Z.Z. Top tradition, while “Smoke That Stuff” can best be described as a Swamp Blues/Hip-Hop anti-drug track (complete with scorching slide guitar and a rap verse). I dare you to try and sit still through “Blackened Tuna,” a hilarious take on the current fitness craze. Closing the proceedings out is “Deltaville,” a biographical track about Flora’s great-grandmother and how she helped stir his interest in music. We’re grateful for her efforts. Halfway Between Somewhere and Nowhere is a sensational disc that grabs you and never lets go. You’ll be hearing more from The Hellhounds. Akron, Ohio’s M. Scott Horn’s guitar work reflects the influence of blues legends like Blind Blake, Robert Pete Williams, Reverend Gary Davis, and even Robert Johnson, but his palate is broad enough to include other artists like Bob Dylan, Guy Clark, Nick Drake, Roy Bookbinder and former Hot Tuna/Jefferson Airplane guitarist Jorma Kaukonen. All these influences are shown to full effect in Horn’s latest effort, Fake As The Blue (self-released). Horn’s guitar style is gentle and soothing and his plaintive vocals are distinctive. The disc consists of nine tracks, four originals and five covers originally done by some of his influences: Dylan, Clark, Williams, and Johnson. The covers are very well done, especially the Dylan tune, “She Belongs To Me,” and Horn’s take on Clark’s “Don’t Let The Sunshine Fool You” is also a standout, as is “Williams’ “Levee Camp Blues.” Obviously, Horn’s musical tastes are as diverse as his talent. Horn’s own compositions range mostly from forlorn tales of lost love (“And I Don’t Know Why” and “Someday”) to the poignant closer, “One I Had.” He also does a jaunty instrumental, “West Coast Blues.” Jim Ballard contributes keyboards and bass on a couple of tracks, but Horn plays solo for the most part. 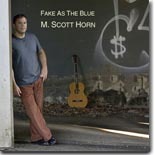 Fake As The Blue was also produced by Horn, and is a nice set of acoustic blues guitar that will please fans of acoustic blues and folk. To purchase this fine set, go to www.cdbaby.com. Looking for a solid mix of blues and roots music to put some pep in your step? The Wheels, from New Jersey, might have the cure for what ails you. Their self-titled release on Barbecue Records features a broad range of styles, ranging from blues, rock, R&B, folk, and surf music. Guitarist Mike Esposito plays acoustic and electric guitar, Dobro, National steel, lap steel, and bottleneck slide. Bassist Vern Miller also plays for the renowned ’60s garage band, the Remains, and drummer Bob Cianci has played in the tri-state area (New York/New Jersey/Pennsylvania) for years and is also a music journalist (Great Rock Drummers of the Sixties). The 13 tracks are a mix of originals and covers of blues standards. The covers are electrified versions of Muddy Waters’ “Rollin’ & Tumblin,’” Sleepy John Estes’ “Divin’ Duck,” and Sonny Boy Williamson’s “Help Me.” As far as the originals go, “I Want You Baby” features some standout surf guitar. Most of the other originals are bluesy, some with a pop-rock feel with the highlights being “When Are You Coming Home,” “Days of Our Love,” “Everybody Wants My Money,” and “I Can’t Dance (The Way I Used To).” Some of the tracks, like “Country Boy (Sure Can Plow),” have a country blues-style groove to them. Esposito and Miller do a good job sharing vocal duties, and Esposito’s guitar work is impressive throughout. The Wheels is a consistently fine disc from a group of musicians who know their way around the blues and other styles equally well. Blues/rock fans will find this to be a rewarding listen. Martin Pugh and Stan Ruffo started out half a world apart (Pugh in England and Ruffo in California), but their love for ’50s-era blues eventually brought them together. Their latest release, No Pork Tonight (Sho’ Nuff Records), is an entertaining look at that era of music, with a few modern touches mixed in. Pugh has a varied background, having played with Carl Douglas of “Kung Fu Fighting” fame as well as serving as lead guitarist on Rod Stewart’s first solo album. He also recorded with the ’60s/’70s blues/rock group Steamhammer and with Armageddon (formed by Pugh with former Yardbird Keith Relf), before stepping back to pursue other interests. Ruffo emerged in the early ’90s and quickly established himself as an entertainer and harmonica player in the central California area. Ruffo encouraged Pugh to pick up his guitar again and the two paired up and have been playing locally and sharing billing at dates with artists like B. B. King and Ray Charles. Pugh plays tasteful leads and fills throughout on a series of terrific instrumentals. The jaunty “MP’s Hideout” will have you jumping, while “No Pork Tonight,” is a jazzy, introspective number, and “Breakfast On Beale” is a soulful tribute to the Bluff City. Ruffo proves himself to be a pretty entertaining composer and has a singing style that will remind you of Rick Estrin of Little Charlie and the Nightcats on tracks like “Just My Luck,” Pot Belly Pig,” and “Little Man In The Boat.” He’s a first-rate harmonica player and also doubles on saxophone on a few tracks, including the instrumental “Pork Ribs.” The closing track, “Torn Pages,” has more of a modern rock feel to it, and shows that the duo is comfortable playing modern sounds as well. This is an impressive disc of blues by two seasoned veterans that pays tribute to a style that’s all too rarely heard today. For more information about this album, go to Stan Ruffo’s website, www.ruffo.com. Stony Plain Records is a Canadian institution. Their 30-year survival, based as an independent record company in Edmonton, Alberta, is certainly remarkable. Via extensive liner notes and an interview included in their thirtieth anniversary set, you learn President Holger Peterson produced his first record (by Walter Horton) in 1972 and officially created the label in 1975. By the early ’80s, Peterson had no money to show for his labor of love. He thought seriously about giving it all up. But Petersen continued to live his dream. You can fully experience them on this rich compilation. Although the songs on 30 Years of Stony Plain were recorded over a span of 40 years (1965 to 2005), most were recorded this decade. On multi-genre disc one, Ian Tyson blends folk and country into pop, while Spirit Of The West mixes drinking with Irish Celtics. Jay Geils delivers a swinging instrumental with spontaneous energy. Alternative music gives a nod to country and western courtesy of Jr. Gone Wild. Blues fans will especially enjoy disc two. Sonny Rhodes has one of the gruffest voices. He uses it to emote a conviction for the blues on a shuffling Texas boogie. Jimmy Witherspoon calls you to appreciate the music. King Biscuit Boy performs in the happy, horn-drenched style of great Canadian blues band like Downchild, who also make an appearance. Of course, Duke Robillard – the label’s most prolific artist – pops up all over. He can be found directly or indirectly on eight songs and four videos. One of them is with New Guitar Summit, who feature guitarists from multiple disciplines. Together, they glorify the years when blues and jazz had not yet become individual silos. Regarding the onerous task of choosing the songs Peterson said, “I picked my favorites and tried to create a flow. Asleep At The Wheel with the Roomful of Blues horns was a natural.” Although it’s just a taste, this widely appealing collection will whet the appetite for anyone with an appreciation for roots music. Wake Up & Worry, the latest record released by Mitch Kashmar on Delta Groove Records, continues the excellence that Mitch displayed on the Blues Music Award nominated Nickels & Dimes. Mitch’s brilliance as a harp player, combined with his lyrical gift in songwriting, continues to bring him to the forefront as a contemporary blues artist to be reckoned with. A Latin feel contributes to the upbeat “Green Bananas.” Tongue in cheek, “Don’t buy any green bananas….you won’t be around that long….you better get on the phone….sing your sad song….don’t buy any green bananas….unless you’re going to give them to me!” Rick Reed on bass and Richard Innes on drums give ‘Green Bananas” a solid back beat and the calypso feel is supported by Kim Calire on the piano. The instrumental “Funky Dee” is up next and showcases Mitch on harp and the guitar talents of Rusty Zinn. Up-tempo with a reggae feel, it almost seems like I’m at Tipitina's in New Orleans enjoying the vibe. Mitch’s phrasing is flawless and gives the tune a very modernistic feel. “Wake Up and Worry,” the title cut, is up next. The whole concept for Mitch’s album is that the hedonistic, 'got to have it now' culture we now live in contributes to our modern day feeling of the blues. Many of us are in the familiar, 'I owe, I owe, so off to work I go' conundrum and the indulgences available to us in today’s society are direct contributors to the blues we feel. Our 'enjoy now, pay later' mentality is catching up to us. “Wake up and worry...if I ever get to sleep….just living on my plastic…falling in too deep” pretty much says it all. Mitch lets us know that he’s a creature of the evening on the next cut, “Night Creeper.” “I’m a night creeper baby…..can’t stand the light of day.” He would just rather play all night and sleep all day. “Half Pint-a-Whiskey” showcases another of Mitch’s vices, drinking. “Half pint of whiskey and a long tall glass of wine.” “Me and my baby are going to ball all night…I got what it takes to keep her right….half pint of whiskey….” Junior Watson’s succinct guitar work accents the bent of our hero to be self indulgent. Mitch’s harp comes to the forefront again on his ode to country blues, “Black Dog Blues.” Alastair Greene contributes some distinctive guitar work on his National resonator to compliment Mitch’s harp in giving this piece its unique feel. I really like the harp on this song and it’s apparent that a little harp is good for the soul. Next up is “You Dogged Me,” a duet between Mitch and Delta Groove owner, Randy Chortkoff. The emphasis is on the mistreatment they’re receiving at the hands of the girl in question….”you dogged me baby but I can’t get you off my mind.” The girl has another man of her own and any inclinations she may have towards the affections of Randy are definitely misplaced. Rarely do I hear dueling harmonicas on a song and this duet is definitely unique. Mitch decides its time to leave and he lets her know it in “Up the Line.” “You took me from my home…wasn’t nothing but a little child…man I heard some promises….man I know it was a line of jive….if I stay another day you’re going to drive me right out of my mind.” Excellent guitar work by Junior Watson and Rusty Zinn augment a strong harp performance by Mitch and bring this song to its logical conclusion. Guitar work by John Marx provides the introduction to “I’m Sorry.” An apologetic tone is taken by Mitch as he apologizes to his woman for the hurt he’s caused. “I’m really really sorry baby…I’ll do anything to make you mine…the hardest thing is to say goodbye if you don’t understand the reasons why….please sweet darling let me back in that bed….I must have been out of my mind.” An outstanding contemporary ballad, “I’m Sorry” is my favorite cut on what has been a great listen. Kashmar’s harp and Calire’s piano playing provide the back drop for the final cut, the instrumental, “The Waddle.” Solos by Mitch and Junior are supported by a strong bass line from Rick Reed, and for some strange reason I have visions of penguins marching in my brain. Can’t really say where that comes from, but it’s appropriate to the song. I enjoyed Wake Up & Worry. Mitch Kashmar is a gifted writer and I find his lyrical stylings to be outstanding. This record has a very modernistic blues feel to it, by design, and a strong supporting cast of Junior Watson, Rusty Zinn, Rick Reed, Jim Calire, Richard Innes and others support the vision that Mitch was striving for. When the worries of the day get you down, this is a record that will bring a smile to your face and help lighten the load. 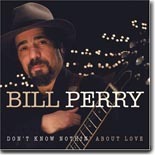 I’m not sure I was ready for the guitar assault that Bill Perry unleashes on his newest Blind Pig Records release, Don’t Know Nothing About Love, but considering that Popa Chubby produced this record, I should have known better. The result is almost 50 minutes of blistering blues guitar that will have some of you running for cover. Perry opens his assault with the up-tempo “Let Me Love You.” ES 335 blazing from the opening lick, Bill lets us know he’s worried about the state of his new love. “Let me want you baby…let me hold you baby…let me want you baby…want you all the time.” He’s got it bad but I’m never quite left with the feeling that she feels the same way. Things are different on “My Baby Loves to Dance.” “She gets home from work…changes all her clothes…mixes up a cocktail or two…calls me on the phone…my baby don’t want to be alone!” It’s time to go out and just dance the night away. “Ball of Confusion” is an apt description of the world today according to Perry. “Sale of pills are at an all time high…number of folk walking round with their heads in the sky.” Not really a flattering picture of life as we know it. Perry’s guitar intro let’s us know he’s had enough on “Leaving Home”. “Got to go right now….I don’t think I’ll be back…always telling me to do this…do this and do that.” He’s had enough and is more than happy to leave the girl behind and go on down the road. “Down in New Orleans” opens with a haunting melody reflective of the pain and depression felt by the city’s inhabitants. “Sun went down…to the still of the night…the birds stopped singing….yeah their happy tune….felt something deep inside….something deeper than the blues.” People in the city were desperate for help that never came. “Down in New Orleans” is an original composition and my favorite tune on this record. “She’s a Burglar” lets us know that Bill’s under the spell of a woman he can’t figure out. “She broke into my mind…she’s a burglar….took everything she could find…..she smiled at me with those honey lips and took away my soul.” Our boy’s lost everything and he’s not about to get it back any time soon. Perry closes out his record on a high note with “Waitin’ for My Luck to Change.” “It’s cold outside…it’s starting to blow my mind…I’m going deep down to Florida…trying to collect my mind….well I’m waiting for my luck….waiting for my luck to change….I got to feel some warm weather cause I’m starting to go insane.” I have the distinct feeling the Bill Perry has already lost his mind. Don’t Know Nothin’ About Love is a rocking blues record and a distinct change from a number of CDs I’ve heard lately. Bill Perry only knows one way and that’s to just let it all hang out. Popa Chubby’s role as the producer is to stay out of the way and let Bill be Bill. He does so in a fashion that showcases his considerable skills as a guitarist and vocally bares his soul as a bluesman. And ultimately that’s what a good blues record should do. I think Bill Perry’s best work is still ahead of him, but I enjoyed the effort at hand. The foundation behind Boo Boo Davis' new release, Drew, Mississippi (Black & Tan Records) is there, as it's apparent that Davis is the real thing. His blues style is rough, raw and authentic. His previous CDs have received rave reviews. For a good example, see the July 2002 issue of Blues Bytes. The stated intention of Drew, Mississippi was to fuse "the raw blues sounds from the Mississippi Delta with modern grooves." To that effect, Davis teamed up with Ramon Goose and his twin brother Joe Goose of the U.K.-based fusion blues/hip hop group Nublues. I applaud Davis for trying to take his music to new audiences and giving it a fresh, new sound. I like when artists stretch the limits and take their music in different directions. But for my taste, this one just doesn't cut it. I had to give up four songs into the CD; I couldn't handle any more of the experimental noise and scratchin' behind Davis' raw, Wolf-style vocals and harmonica. I'm sure there's an audience out there that will appreciate the music on Drew, Mississippi, and more power to you. But it's not for me.